Here’s a lazy effort from me. I sporadically press ‘Play’ on one of my Spotify Daily Mix selections. Based on my listening habits. No doubt relying on a fiendishly clever algorithm similar to that which my supermarket uses to tailor delivery of the money off coupon I’ve always wanted. So I allowed the tracks to build up and grabbed wodges of them to construct what you see - and what you might soon be hearing. All I had to do was ‘Skip Duplicates’ which tended to crop up. Before I knew it over ten hours of listening had assembled. This is a focused assembly which by no means reflects the full scope of my music tastes. But it doesn’t throw up much that I would edit quickly in shame. Have a listen. I’ve done all the hard work for you. 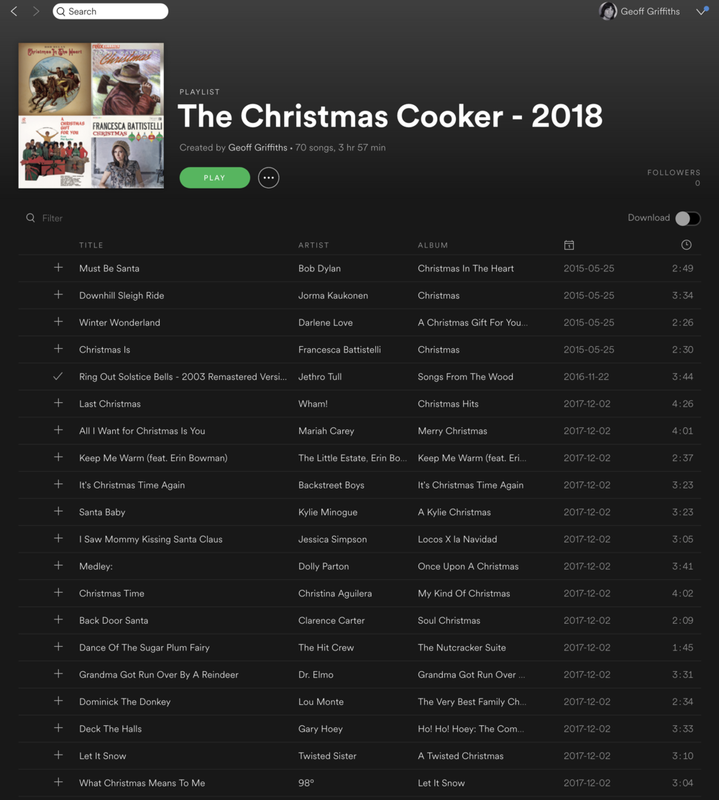 Oh… no, I haven’t really, have I.
Christmas Cooker 2018? Gone. Ah, well… soon be Christmas, eh. In the meantime might I offer this small distraction. I’ll sell it no more than that. Your mission, should you choose to accept it, is to apply quality control of your own. I do agonise (only very slightly) over track order. You might press ‘random play’ and serendipitously arrive at a running list more in line with your own ineffably good taste. And there we must leave it. 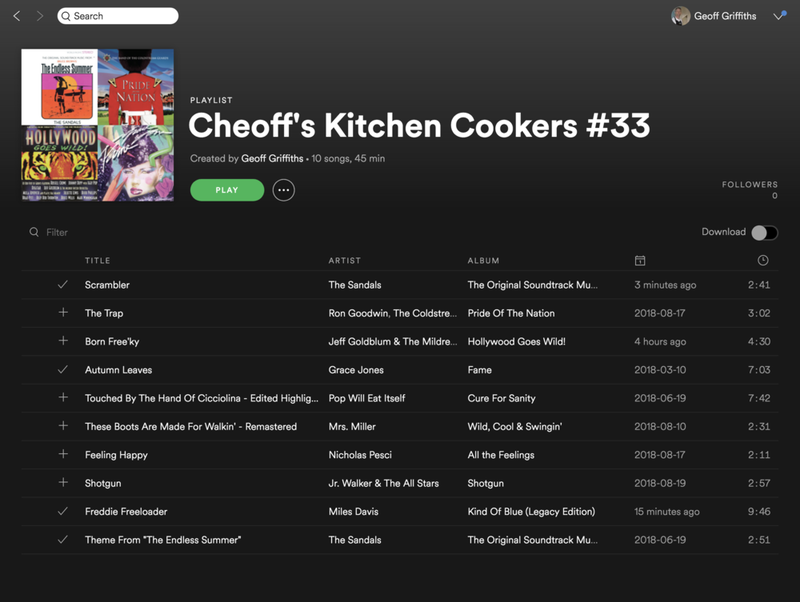 I have a few ear-worms crawling around already which could inhabit Cooker #36 but I seem to be putting at least two months in between posting these playlists. So I have plenty of time to think about the final tracks for next time. Unless, of course, you’d like me to get a shift on and present things just that bit sooner. Quite a few usual suspects here with some dragged back from my Christmas past to be played again for the first time in a long time. You’ll see that I didn’t put in a filler to stretch this into a fifth hour of listening. You can, of course, line up my tracks and cram it full of your own selections. Christmas is all about the stuffing, isn’t it! I do hope most of you will be able to share some sort of joy with a few loved ones over the holiday. Remember - where two or more are gathered together in the sight (and sound) of a Cheoff’s Christmas Cooker toe-tapping, barely-controlled gyrating and tasty food are bound to follow. For anyone who might be lonely, for whatever reason, may you keep yourself together in preparation for what we could all do with… better things in the new year. Here’s hoping to see you all again in that there 2019. 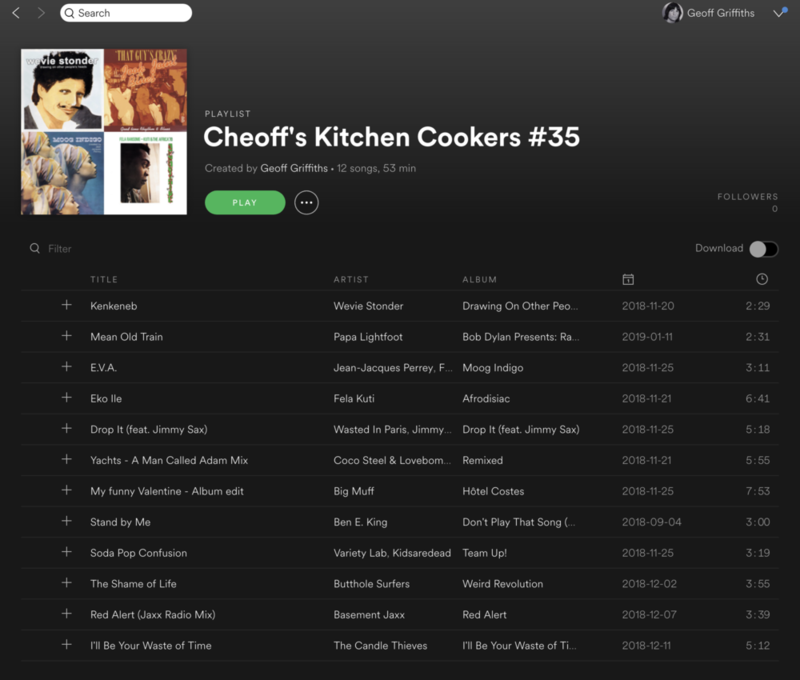 Hard on the heels of Cooker #33 comes this. 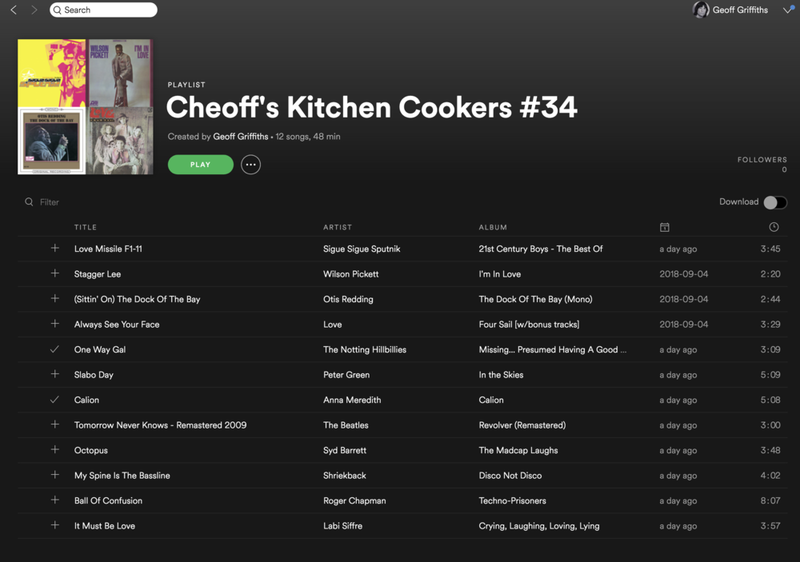 I agonised for many hours but finally fell into the ridiculous trap of calling it ‘Cooker #34’. Huge apologies for my lack of creativity. Erk. Hang on. I withdraw that awkward sorry-saying. Reviewing the tracks assembled here is giving me a small wobble of suspicion that they offer opportunities for a spot of fleeting enjoyment. My advice is to listen fleetingly… you know what they say about too much enjoyment. The Spotify thingy will open if you click on this image… allegedly. I’ve been away rather a while. Sorry. Let’s get going again. An opener from The Sandals full of surf rock sunshine. Oof, those sixties summers… I was there, you know. In the very same 1966 that The Sandals soundtracked ‘The Endless Summer’ I was listening to tune number two here. I watched ‘The Trap’ at the Reigate Majestic just after turning fifteen. A simmering affair of a film in spite of its Canadian cold setting. I still find myself humming Ron Goodwin’s theme music. The main reason for that is that it’s been revived and sustained in my memory ever since 1981 when the BBC used it to underpin their live coverage of one of our iconic sporting festivals. You should recognise it in that context even if you don’t go back as far as Oliver Reed, Rita Tushingham and me. Heck…none of you is as steaming well old as me, are you. Please don’t miss the inimitable (unless you include Florence Foster Jenkins) Mrs. Miller who is sandwiched between, among others, the lounge-lizardly lovely Jeff Goldblum and a sultry, touched-by-torch-song Grace Jones. Great to be with you again. Serious plans to supply another Cooker very soon. But you know how badly I do serious. Let’s see. Oh… but let’s listen first. This is not just a picture. This is a picture that’s a magic mouse-click away from something to look at with your ears. I really should confirm that you are completely at liberty to listen to the enclosed offering on a bank holiday or any other day. Some even listen without cooking... that is also perfectly acceptable. And while I fully acknowledge that some of you may not in fact be completely at liberty might I take this opportunity to share my hope that you very soon find release from anything which restricts you. Click... and the ears get it. Looks like I set my alarm and didn’t hear it. Anyway, I’ve had a bit of a ‘lie-in’ and gone right through a couple of months without offering even a predictable Christmas Cracker Cooker. In my defence, this is a part-time gig with a lousy contract that doesn’t include any remuneration that I have to declare to HMRC. The music was there, just waiting to come out, of course. And here it is. 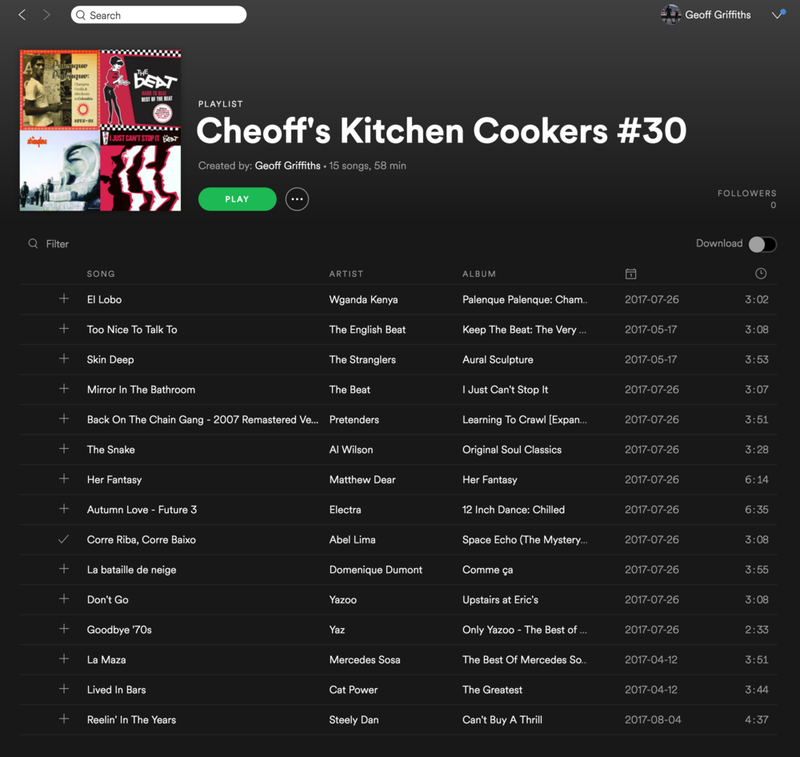 No guarantees that you’ll listen right to the end… but a click on the pic gives you your Starter For Ten (just realised that really is the number of tracks – yay for serendipity!). Proceed with caution. But always remember I’m doing this for love not money. *Note to self: Set up crowdfunding page, draft a few pleading paragraphs and investigate tax havens. Yes, yes, I hear you. It's actually 'thirtynothing'. Please understand that I am at least as pedantic as you and recognised my offence immediately. 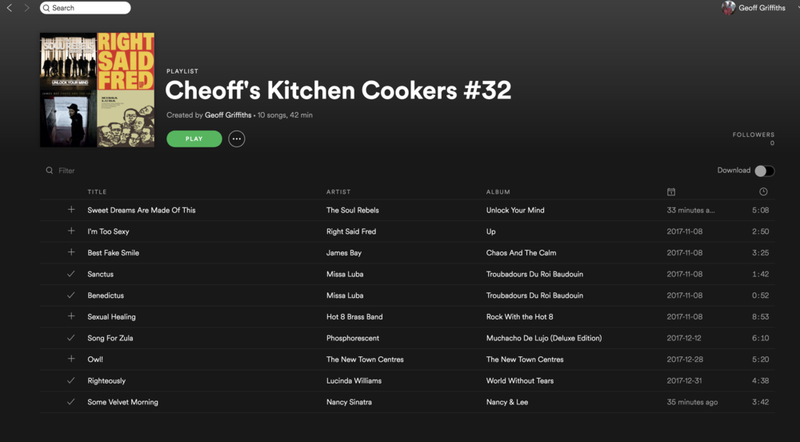 Hey... let's lighten up and momentarily distract from our pit of niggardly nit-picking by listening to the assembly of tracks which had to wait until #Cooker 29 was a dim distant memory. The jaunty opener for the last of my #Cooker 'Twenties' has a little back story available here. I do hope that won't distract you too much from the main thrust... the music itself. It's too late, isn't it. I've started something. You're already off surfing and browsing (or whatever verb we are supposed to use now) and finding links to lyrics, previous band members and trivia which is horribly diverting. Go with it. But do come back for some music... and a little more cooking if you will. Just back from a rather smashing slightly-less-than-a-fortnight French holiday. You'll have to look elsewhere for further information about that smashingness. You are here, of course, solely to finger your mouse, tap your touch pad or screen or maybe even massage your mobile and gain access to the latest offering of sounds which scientific research agrees can improve your cooking skills. So, with a gentle reminder to always be on guard for spurious claims in the culinary world, I leave you to explore number twenty-eight. A bit of rough with the smooth in this one. The ‘rough’ being just an awkward way of describing the contrasting, jingly jangly tracks punctuating quite a bit of relatively soft and gentle stuff. Before we get there, you’ll find twenty minutes of the Orb and the track with which John Peel had a love/hate relationship. He loved it for itself… and resented it because including it would limit the time to play other music on his shows. You could, of course, simply flip straight to this one after preparing risotto ingredients. By the end of “A Huge Ever Growing Pulsating Brain That Rules from the Centre of the Ultraworld” you have had a stirring countdown to grains which are sticky but still have a bit of bite. Listen out for a Minnie Ripperton sound-alike! Click on the playlist above to... erm... play my playlist. 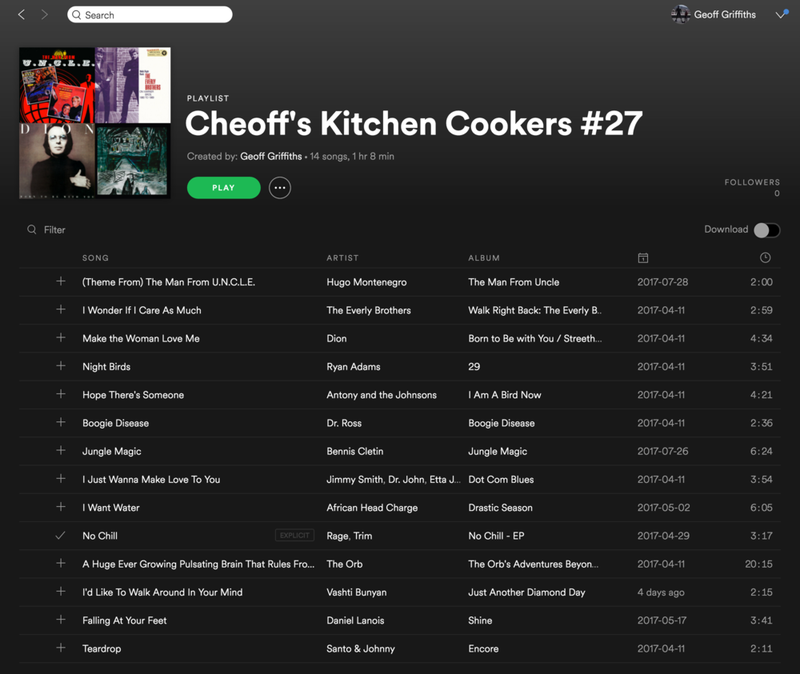 Oh, parping poop, I still haven’t booked any tickets for the Erasure tour… but the opener of #Cooker 26 rather demands that it should be done very soon. 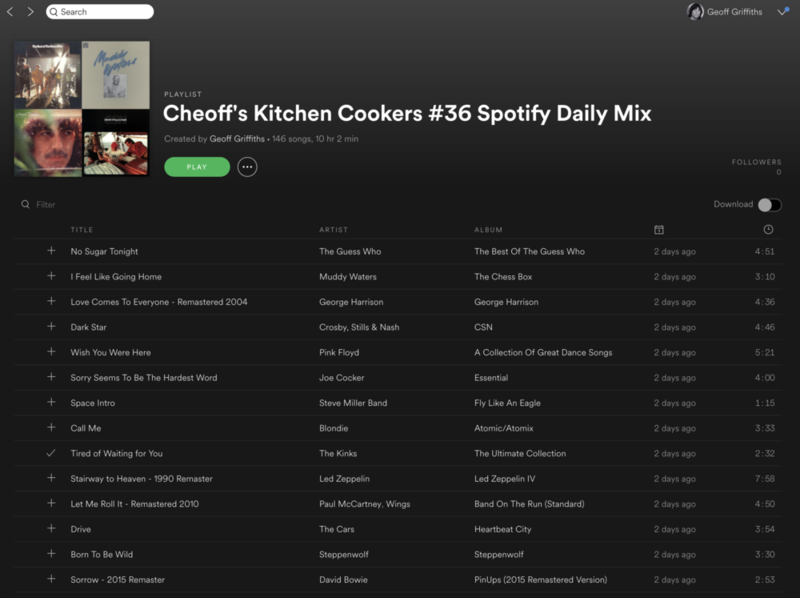 I can’t give you any more than fifty minutes of juicy (never from concentrate) goodness to complete this particular playlist but I am of the firm belief that the aural assault on offer will satisfy in the extreme. Do let me know if I have disappointed in any way… refunds are only available within 28 days of listening!